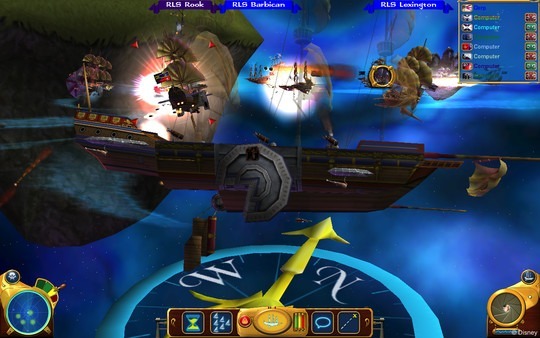 For years, one of the most obscure games I owned on disk was Treasure Planet: Battle of Procyon by Barking Dog (the same folks behind Homeworld Cataclysm). Lo and behold, exactly one week after we had some former Barking Dog folks on our podcast talking about THIS VERY GAME does it arrive on Steam! And currently on sale to boot! Now you can finally experience the colorful game I call, “Baby’s first Starfleet Command” for yourself! Check it out folks, it’s a pretty solid title all told! I had just finished listening to the latest podcast episode with the Barking Dog developers and the next thing I see is a blurb about Disney games on Steam and was amazed when Treasure Planet was on there. Did not expect that. I’ve heard of this game for years, and people would often say look past the license/Disney Universe, and the gameplay is great! Of course, difficulty in obtaining it blocked me from playing, but now… Wishlisted on Steam! I’ll add this to my wishlist. I’ve thought about playing this game for a while but could never find it. Did the guys who worked on this go on to start Kerberos and make Sword of the Stars? Next story February, 2015 Game of the Month – Homeworld: Cataclysm – Entry 2 – Upgrade What Now?